RAF Boreham photographed on 20 April 1944. Throughout much of the postwar years, Ford Motor Company preserved much of the airfield as a proving ground, however in recent years extensive quarrying has removed much of the south part of the airfield. B-26 Marauders of the 394th Bomb Group at still-unfinished Boreham Airfield, 14 March 1944. Opened in 1944, it was used by the United States Army Air Forces. During the war it was used primarily as bomber and a troop transport airfield for paratroopers. After the war it was closed in late 1945. Essex & Herts Air Ambulance was based here from its launch in 1998, when it only served Essex, until 2011. In 2008 Hertfordshire was added to the service. G-ESAM was a Bölkow 105, operated between 1998 and 2003. Eurocopter EC135 operated from May 2003 until 2010. In 2010, in line with the new aircraft for Hertfordshire, Essex's aircraft was upgraded to an MD902. 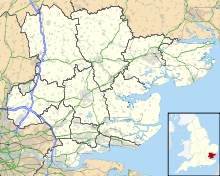 Boreham was known as USAAF Station AAF-161 for security reasons by the USAAF during the war, and by which it was referred to instead of location. It's USAAF Station Code was "JM". Their group marking was a white diagonal band across the fin and rudder. In the weeks that followed, the 394th was repeatedly sent to attack bridges in occupied France and the Low Countries, which led to its dubbing itself 'The Bridge Busters'. The 394th was moved on 24 July to RAF Holmsley South in the New Forest. The airfield was closed in 1945. The Essex County Council made use of some of the domestic site Nissen huts to house the homeless and the land was used by Co-Partnership Farms. In the late 1970s Boreham Proving Ground was the test site for Ford Heavy Truck Development. The development engineers at nearby Ford Dunton worked out various test programmes, and the Test Engineers at Boreham carried these out and reported back the data. One common test was RLD, or 'Road Load Data', where a chassis would be fitted with various strain gauges, and the data from these recorded. This was the main test site for Ford Trucks, and the Ford Cargo, released in 1980, was extensively tested here against competitor trucks. There were many various surfaces at Boreham to drive the trucks on. "Rest of the World" road, was a fairly rigorous route, with smooth surfaces, some undulating surfaces and some pot-holes. "Korean Road" was full of pot-holes and considered to be the worst test for a truck. Test drivers were not very happy if they were allocated four days of driving "Korean Road" to gather RLD since they were bumped around in the cab constantly. Aside the main entrance to Boreham was a small unit that was Ford Rally Sport. They built the Ford rally cars of the late 70s and early 80s there. ^ "Boreham". Airfields of Britain Conservation Trust. Retrieved 3 June 2016. ^ Erwin, Miles (14 April 2009). "Metro". London: Associated Newspapers Ltd. p. 17. ^ "Boreham airfield". Control Towers. Retrieved 24 December 2012. ^ "Police Air Support". UK Emergency Vehicles. Retrieved 24 December 2012. Wikimedia Commons has media related to RAF Boreham.